The lipid-rich sheath surrounding AXONS in both the central and peripheral nervous systems. 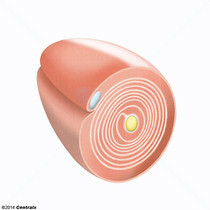 The myelin sheath is an electrical insulator and allows faster and more energetically efficient conduction of impulses. 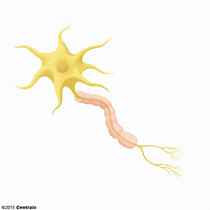 The sheath is formed by the cell membranes of glial cells (SCHWANN CELLS in the peripheral and OLIGODENDROGLIA in the central nervous system). Deterioration of the sheath in DEMYELINATING DISEASES is a serious clinical problem. Regularly spaced gaps in the myelin sheaths of peripheral axons. Ranvier's nodes allow saltatory conduction, that is, jumping of impulses from node to node, which is faster and more energetically favorable than continuous conduction. 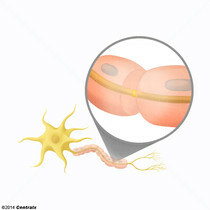 Nerve fibers that are capable of rapidly conducting impulses away from the neuron cell body.